Thank goodness I'm out of high school. How I survived in the first place remains a mystery, and I didn't have anything remotely like the experiences of Miss Ruby Oliver. I spent the better part of this week feeling awful for a girl I have never met. Really awful. I wanted to yell at her...I wanted to yell at her friends...I wanted to strangle her parents...and I wanted to start seeing Doctor Z myself. E. Lockhart definitely knows how to write about awkward situations. I was starting to worry that the teen angst was going to get out of hand, but the miraculous Doctor Z helped Roo (love the nickname by the way) get some perspective. Lockhart is also very clever in her arrangement of a story. The "boyfriend list" as each chapter was brilliant, and she weaves between storytelling and present telling with such ease. From this moment forward, I dub this the summer of Lockhart. Two books down, five to go. 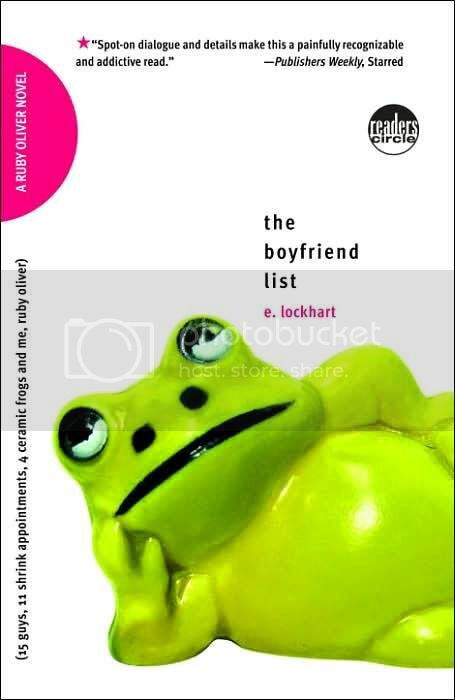 If you're a fan of witty, realistic, female centric novels along the same lines as Sarah Dessen, Elizabeth Scott, Stephanie Perkins, and Sarah Mlynowski, check out The Boyfriend List by E. Lockhart.